Peter Cushing, Christopher Lee and Denholm Elliott star in one of the best Amicus anthology horror movies. ABUK R2 DVD & boxset. After their early success with the format, the Amicus producers Milton Subotsky and Max Rosenberg seemed often reluctant to make another portmanteau horror film, and during the 1960s experiemented with a variety of genres and styles, meeting with, at best limited success. 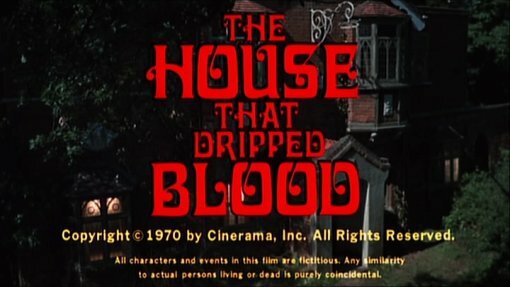 The House that Dripped Blood (1970) was their third anthology horror film and is a great example of how well the format can be used - although it has just four stories (as Torture Garden (1967)) compared to the usual five, allowing more time for each story. Although the link story is very poor (especially the ridiculous attempt to provide an "explanation" at the end), all four of the episodes work well and although the first three could have been extended a bit more, none of them feel over rushed, or drawn out, unlike many of the Amicus anthology stories. Method for Murder is a nice little story, with some effective jump scares, although writer Robert Bloch (of Psycho fame) seems to go the wrong way with the ending, and it doesn't really make sense. The second tale is often rated very poorly, because of the rather daft waxworks focus (would a painting perhaps have been a better centrepoint? ), but it does work quite well - a saga of lost love and regrets that will probably strike a chord with many viewers. Sweets to the Sweet is a solid segment, well written throughout, with some good tension towards the end but simply a little unmemorable, particularly on a second viewing. The final story is a great finalé to the film (or would be, except for the unnecessary coda from the link story), making a gentle mockery of the gothic horror films. Putting the comic episode at the end of the film is probably the best place for it, leaving the viewer entertained as the film ends, and not distracting from the more scary opening stories. Director Peter Duffell does a generally good job here, building some tension and a few scares in parts one and three, but he gives his best work in Waxworks that gets a beautiful representation of solitude set to Franz Schubert's wonderful Death and a Maiden (1824) and a fantastic dream sequence lit like a Mario Bava film - although sadly that particular story is let down by a rather ugly looking mannequin. The rest of the soundtrack is provided by the little known composer Michael Dress who provides a minimal but quite effective score. The third Amicus anthology production boasts a stronger than usual cast. Denholm Elliott was an unusual choice, although he had appeared in three television horror stories in the late 1960s, even playing Dracula in an episode of the ITV series Mystery and Imagination - he gives a superb performance as the tortured novelist. Peter Cushing was all but essential casting (the American funders insisted on him, along with Lee and Pitt) and gives one of his best performances as a man haunted by lost love, at the time he was deeply affected by the terminal illness of his wife, and it appears to add an increadible resonance to his performance. Christopher Lee plays one of his usual, rather uptight roles, and is well cast opposite the diminutive Chloe Franks. Jon Pertwee was, at the time, the face of Doctor Who, but his casting here seems to be more in reference to his earlier career in British comedy films (most importantly perhaps, Carry on Screaming! (1966)) and he gives a wonderful performance opposite the noticably buxom Ingird Pitt, who at the time was a hot horror movie property and has to spend most of her role simply looking pretty - but does it well. The House that Dripped Blood is probably the best overall Amicus anthology film. The Cloak is certainly one of the studio's most effective all-out comedy efforts, and although none of the three 'horror' titles rank in Amicus' top five, they are all solid productions, without the 'duds' that ruin many of the other portmanteau works. A quintet of superb acting performances, and some inspired direction from Peter Duffell (particularly on part two) really help in setting the film above its rivals. Recommended to Amicus followers, and a great place to start exploring their work for any classic horror fans. Anyone famous in it? Christopher Lee - best known for his Hammer work he also starred in Euro-horror, including Horror Express (1973). Peter Cushing - the most regular Amicus star, best known as Hammer's Frankenstein and Van Helsing. Denholm Elliott - a well known British actor, who also starred in Hammer's dire To the Devil a Daughter (1976). Ingrid Pitt - the Polish beauty who made her name in Hammer's Vampire Lovers (1970). Directed by anyone interesting? Peter Duffell - an otherwise little known British director, who also worked on the highly regarded mini-series Flambards (1979). Is it scary? There are a couple of scenes that might prove scary, but nothing much. A great place for Amicus newcomers, and generally enjoyable for all classic horror fans. The print is good with only mild grain and only minor print damage. Audio English original mono sounds fine, plus rather unnecessary 5.1 and DTS remixes. Audio Commentary with director Peter Duffell and British horror writer Jonathan Rigby. Some good conversation and plenty of interesting facts come out about the film. Text biographies for Peter Cushing, Peter Duffell, Denholm Elliott, Chloe Franks, Christopher Lee, Jon Pertwee and Ingrid Pitt, plus notes on the film and excerpts from contemporary reviews. 77 image manually scrolling photo gallery. Availability A single disc release, and on an identical disc in the Anchor Bay UK Amicus Boxset. Other regions? Available on DVD in the US from Lion's Gate, without the interviews or commentary, but a new interview with Max Rosenberg. Also a German DVD with no features. Probably the best overall Amicus anthology horror film, with a great cast and some inspired direction. Recommended. A very thorough selection of extra features, coupled with a good looking and sounding print. Find other Amicus Productions, and other films starring Peter Cushing, Christopher Lee or Ingrid Pitt. More details about the Amicus collection boxset. All text in this review written by Timothy Young - 8th August 2007. Part of Horror September 2..